This Is Not Your Ordinary Chicken Burger Recipe. It’s The Best, The Juiciest, The Easiest Burger You’ll Ever Make. The Chicken Avocado Burger is probably one of the juiciest burgers we make in the CBB house because of a secret ingredient and grilling technique that you must know about. I’m a huge fan of the beef burger and I have secrets up my sleeve to create the perfect beef burger however every once in a while I like a different protein like turkey or chicken in place of beef. Although beef prices have slowly been coming down in Canada it’s still cheaper to find chicken and turkey mince for a fraction of the cost. I can get 2lbs of chicken mince for $12 where beef would cost me $21. The price difference is hefty for anyone on a budget but what you can create with a wonderful mince is by far the best part of all. Keep in mind when you are grocery shopping that buying a 1lb pack of mince that will make 4 large burgers such as this chicken avocado burger recipe that it becomes relatively inexpensive compared to eating out at a restaurant. Back a few years ago I blogged about comparing eating out vs. eating in and a burger was on the menu for us that night. The results were disturbing but that’s what you get for convenience plus you don’t get to see what ingredients actually go into your meal. Homemade is always better for that reason. Why did I add avocado into my Chicken Avocado Burger? I know you’re all wondering why and the answer is simple, good fats for the diet. We buy avocados every chance we get if they are on sale paying around $3.99 for a bag of 5 unless we find them on the reduced rack which does happen often. Although they are fruits, avocados have a high fat content of between 71 to 88% of their total calories—about 20 times the average for other fruits. A typical avocado contains 30 grams of fat, but 20 of these fat grams are health-promoting monounsaturated fats, especially oleic acid.- The World’s Healthiest Foods (TWHF)– Everything you need to know about an Avocado. We tend to look for bags of avocado that are harder so we can ripen them at home ourselves. We keep our avocados in the refrigerator and take a couple out at a time to sit in a bowl on the counter. In about a day or so we have avocados ready to eat but it’s a guessing game to figure out whether the avocado is ready to eat. Although it’s not recommended that you keep avocados in the refrigerator until they are ripe you can refrigerate them whole which we do. If you slice your avocado it can go brown quickly so add a dash of lemon juice to your avocado and put it in a baggie until you are ready to use. Another cool trick that I found works is that if you use only half of an avocado keep the outer skin and put that over top the remaining half. This keeps the avocado from going brown and you can eliminate the lemon juice step. Typically you’d want to eat your avocado once cut as soon as possible for best flavour. 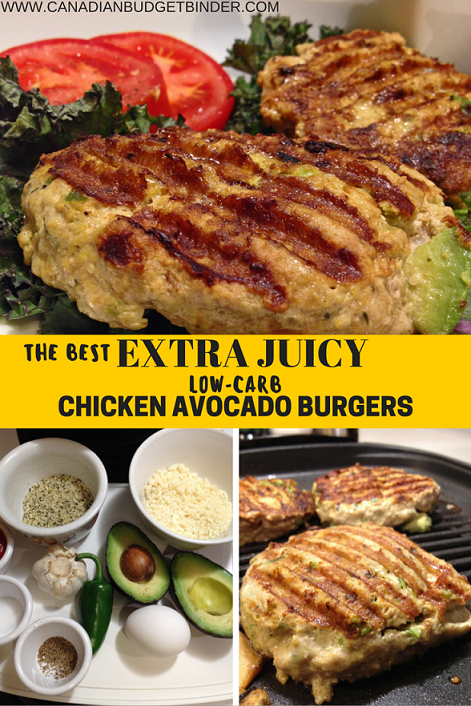 Why a Low-Carb Chicken Avocado Burger? If you’re a regular reader of the blog you will know my wife has been on a low-carb diet for almost a year now. She loves it and she looks great as she’s shed the pounds she gained while pregnant with our son. What she loves about the low-carb high-fat diet is that she can eat fats and there are so many recipes you can create for the carbs that she’s taken away. This chicken avocado burger is also great for the Paleo Diet as well. We make a lovely Oopsie bread that is perfect for burgers and sandwiches. Our low-carb waffle is a must in our house for grilled cheese, toast and all sorts of sandwiches. Check out my recipe index for low-carb meals we’ve created over the past year. 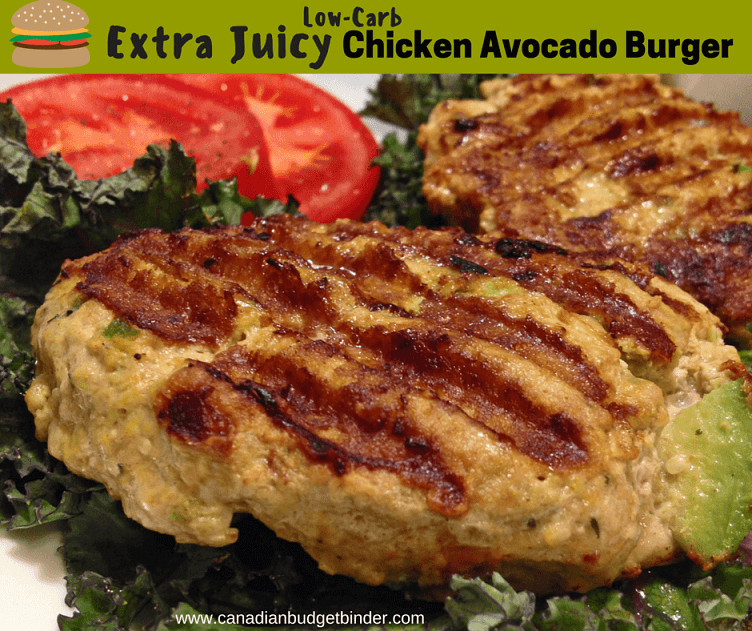 How is the chicken avocado burger low-carb? Well there are no breadcrumbs in this burger which can easily drive the carb count up very high. Instead I’ve replaced the breadcrumbs with hemp hearts (You can use Almond Meal) plus a generous helping of freshly grated Parmigiano cheese. It’s important to buy the good Italian Parmigiano Regiano cheese for optimal flavours. Other key ingredients to boost flavour are none other than butter and the jalapeno pepper. You can use any pepper you fancy but we like the milder flavour of the jalapeno. It’s important to scrape out the seeds unless you want a hotter chicken avocado burger which works equally well. How do I make this chicken avocado burger extra-juicy? It’s all about the butter baby and one other ingredient, tomato puree!!! The tomato puree helps with the moisture of the burger and the butter adds flavour. I cook the Chicken Avocado Burgers on an indoor-grill on high heat 230 degrees as high as the grill can be set. I put the burgers on the grill once hot and add a knob of butter on top of each burger then put the lid on the grill. After about 4-5 minutes I add 2 tablespoons of cold water to the grill and immediately put the lid back on. Once the water has found its way into the burgers with-in a minute I flip the burgers for another 3-4 minutes and repeat the above process. Don’t press the burger or flip them more than once a side. This chicken avocado burger is large so it’s important to make sure you cook them thoroughly. You will see lovely chunks of green avocado poking out your chicken avocado burger which adds to the eye-appeal of this chicken burger. Your guests will love it, you will love it and your family will ask you to make them again and again. You can top your burgers with more cheese or sautéed mushrooms in the butter you already have on the grill works well. The only spices in your chicken avocado burger are salt and pepper. You don’t need to add much salt because of the Parmigiano cheese and butter but keep in mind you want flavour or the chicken will be bland. Keep your avocado in chunks and when you mix the chicken burger mix in the bowl don’t worry if you still have chunks of avocado because you want this. Form the chicken avocado burger mixture into 4 burgers and refrigerate for 10 minutes. The mix will seem a bit soggy but that’s how it should be. You must be very gentle with the burgers and use a spatula at all times. If your burger loses a bit of form when you set it on the grill just help it back into a round shape. Easy! These are Chicken Avocado Burgers which may sound unique but when you are on a low-carb diet all creations become special such as this one. What I love about this Chicken Avocado Burger is that it has tonnes of flavour but most of all it's super juicy and not dry. This chicken avocado recipe is simple to make and has very few ingredients as any burger should. Serve your burger on lettuce or on a low-carb bun or waffle alongside a Simple Italian Tomato Salad. I wouldn’t suggest using the BBQ as these chicken burgers are moist and may fall apart on the grill without the technique I use to grill them below which is a bit harder on the BBQ unless you have a grilling plate. If you do try it out on the BBQ please leave a comment below. Who would have thought avocado can be turned into a patty? Amazing recipe!